The Munich, Germany-based pianist and composer Carlos Cipa has released two records to date: the stunning debut solo full-length LP ‘The Monarch And The Viceroy’ (2012, Denovali Records) and ‘Relive’ (2014, Denovali Records), an EP recorded in collaboration with partner Sophia Jani. ‘Relive’ contain the side-length tracks ‘Anouk’s Dream’ and ‘Whatever A Sun Will Always Sing’; both written specially for the pair’s performance at the Denovali Swingfest 2013 in Essen. The resultant compositions were played exactly as in the live situation with no electronic manipulation. 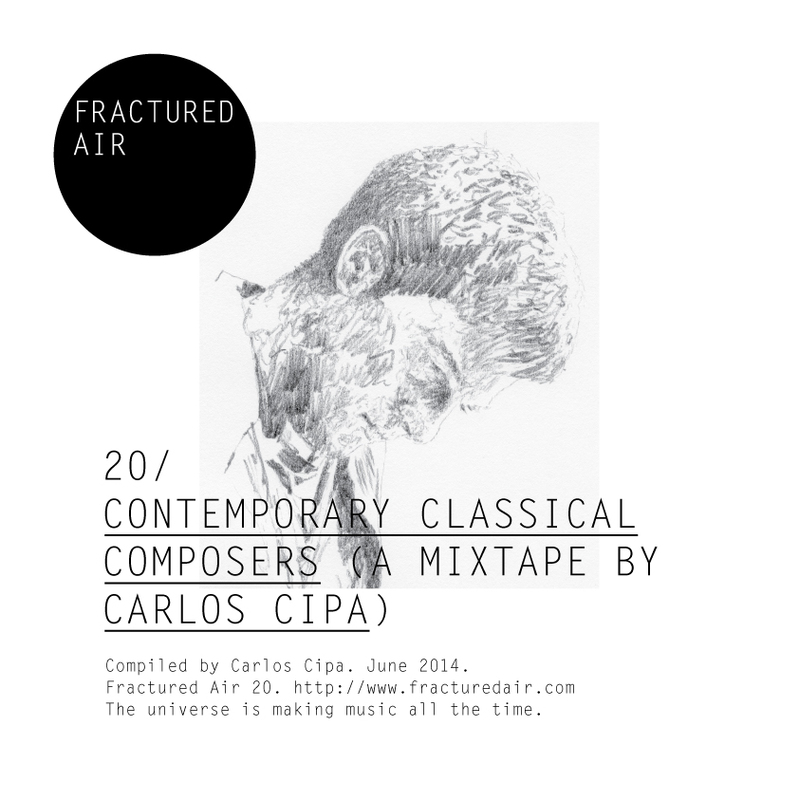 Both classical and modern artists provide inspiration for Cipa’s work as a composer: Cipa has cited the great composers such as Mozart, Debussy, Ravel, Stravinsky; while the works of modern bands such as The National, Mogwai, Sigur Rós and Nick Cave have also influenced Cipa’s outlook as an artist. He is the master. The sense for rhythm and pulse is just incredible. He was one of the most innovative voices of all time. You can learn so much from Stravinsky, regardless what music you create. You don’t need to say something about Steve Reich. Definitely one of the most influential composers of the second part of the 20th century. This piece is a rather new one, that won him the Pulitzer prize. The whole piece is amazing! One of the most beautiful pieces ever written. I deeply love string quartet as instrumentation, it will never sound antique, always timeless. And Ravel’s String Quartet is one of the best. A classic piece. But still, Ives is an underrated composer; what he thought of and did in his music was always much more experimental and much more modern than a lot of his contemporaries. This piece is from 1908!!! True beauty and innovation. Written in 1989, this is one of the most interesting pieces of the last twenty-odd years. Tüür has an incredible unique voice, that always touches me deeply. Fantastically played on the album ‘Cycles’ by James McVinnie, this is an amazingly beautiful piece. And the sound and the colour of this instrument is incredible. David Lang is a master in terms of voices and singing. It’s very encouraging to write for voice, when you listen to his beautiful music. The beautiful sound of this instrument (Ondes Martenot), such a beautiful piece of music. His output is so versatile, so colourful, and regardless what he touches, he creates something unique, something new, but always in the most musical sense. That’s a very rare gift in contemporary classical music. Last year he was in Munich for a concert with our chamber orchestra and they played this and a lot of other beautiful pieces he wrote in the last 15 years. Before the concert he was being interviewed by the conductor and just told funny stories about his work. Very inspiring and friendly person. Probably, his most famous piece, but the energy in this music is unmatched. This is only four instruments, but you feel a group of a hundred running over you. Very hard to get this movement out of it’s context, all the movements are fantastic. You have to look at his scores. Everything is written by hand, he was a master of calligraphy and to see the relation between notation and how it sounds is just amazing. Rather unknown German composer, one of the few who were inspired by american minimal composers and made a beautiful piano cycle called “Das Buch der Klänge”. And again a String Quartet, this is very unusual for Adès, but I believe it’s the most beautiful 3 minutes he ever wrote. A minimal classic. I recently saw this piece performed live, and it was really an amazing experience. I had to include this piece, despite its length, it’s just too beautiful. String Orchestra is another beautiful instrumentation, and Vivier is an underrated master when it comes to it. This might be the piece that impressed me the most lately. The use of the orchestra is incredible, (it has 12 double basses!!). Kurtag is a master in saying so much in such a short time. Impressive. It’s hard to separate the movements, go check out the whole piece, it’s incredible! ‘The Monarch And The Viceroy’ LP and ‘Relive’ EP are available now on Denovali. Interview with Carlos Cipa HERE.